Global indices have proliferated in recent years, offering citizens, academics, and policymakers ways to measure change in the world. These indices give us approximations of where goals have been achieved and where more work needs to be done. 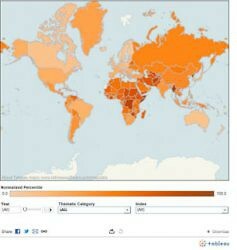 An interactive map and data on thirty indices, ranking countries on issues such as human rights, conflict, governance, gender, environment, fragility, and more.